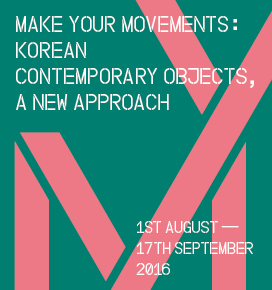 The Korea Craft and Design Foundation presents Make Your Movement: Korean Contemporary Objects, A New Approach (1 August to 17 September), an exhibition curated to showcase a new phase in Korean craft, influenced by the concept of ‘movement’, at the Korean Cultural Centre in London. The exhibition brings together 18 designers, makers and craftsmen from Korea whose collections range from 3D printed accessories and furniture to jewellery and ceramics. Curated by Kyoungrin Park, the show explores the theory of movement in craft, taking as a starting point the way craftsmen move during their creative work, and how a completed object leaves the hands of its maker imbued with his/ her manual knowledge; it then travels to an exhibition hall, an art gallery or a store, therefore generating another movement.